The dreaded 1st flight with baby has arrived. AJ & I are prepared. Let me rephrase. We are prepared to have angry passengers glare at us for 5 hours, possibly throwing things at us, as we fly from LA to NY. We have argued about which bags to take and we have argued about what baby will need in flight. We have argued about which pacifiers she would need and which types of blankets. Now that the flight is over, I’m not sure why he argues with me. I’m always right, at least when it comes to the baby. Once we arrive at the airport we are kind of calm. Actually I’m kind of calm, I kind of took Xanax. AJ is not so calm, but that’s his problem, I offered him a Xanax and he said no. Don’t worry, though, I checked with the doctor and he assured me it was A) ok to offer my prescribed drugs to my husband and B)perfectly safe to breastfeed while on Xanax. Once we get to the gate, AJ leaves me to get a coffee. Fact is, AJ always falls asleep on planes while I sit there awake & panicking until we land. So this time, he’s drinking coffee. He assured me he would stay awake to help me with the baby on the flight. AJ gets back and I have to quickly run to change Maggie because the plane is about to board. Oh no I’m starting to stress. We board early but it’s not early enough as we don’t quite have the time to get everything in order before other passengers start pressuring us to move faster. More stress. 6:30 departure time comes and goes and we still haven’t moved. More stress. Baby starts to cry. Oh no. This is my nightmare!!! I get up to walk with baby to calm her nerves and mine. And for the first time ever it worked. On my way back from the bathroom I see a Kardashian is on our flight. Once again, the world is right. Nothing bad can happen on our flight, there is a “celebrity” on our plane. Even better a reality celebrity that makes a lot of money for a lot of people. E! won’t let anything happen to our plane, unless it’s good for ratings. When I get back to our seat, baby is calm but husband is asleep. Note to self: Lace AJ’s coffee with N0-Doz. It’s my only hope of keeping him awake on the plane. I give baby a bottle as we take off and like everyone says, it works perfectly. She didn’t utter a peep and fell right to sleep on the makeshift bed I set up on my lap. I was uncomfortable all flight since I had to push on my tip toes in order to give her a flat bed to sleep on, but it was worth it. 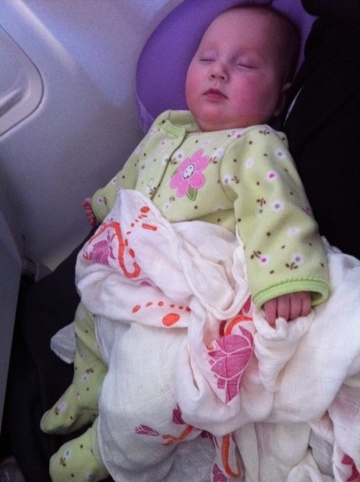 She slept until the last 45 minutes of the flight. We gave her another bottle as we landed and she didn’t fuss a bit. 2 Responses to "First Flight"